Players Pack 1.1 is available. The Force Awakens F1: Ambush with 100 point Rebel (and 6 mine tokens) and 115 point Imperial (from Force Awakens missions). A dog fight in the middle of mine field. Slave 1 Expansion Mission 5: Preystalker, 150 point Rebel to 90 point Imperial. Hunt down and destroy one target Rebel ship before your fleet is destroyed. Imperial player may field a Scum fleet instead. Millennium Falcon Expansion Mission 4: Den of Thieves, 100 points each. Capture the cargo before it is escorted off the battlefield. Mega Dogfight: 150 points with half fleet deployed at start and remainder arriving in round 3. Missions will be reprinted in the players pack. Players will be able to bring a different list to each scenario. 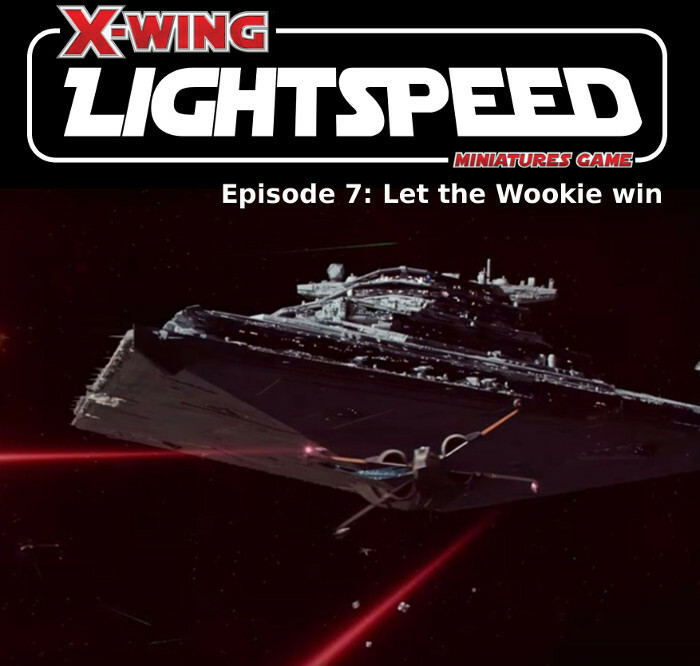 Lightspeed is a Rebel versus Imperial only competition. Upgrade cards from any set can be used. As this is not an FFG tournament event proxy cards are allowed to be used for upgrade cards; originals must be used by used for damage decks, ship cardboard overlays and movement dials. Proxies must match the size and display of the original cards (or FAQ updated views) to be used. Players Pack link added to the original post. Infinity Games has joined in the list of sponsors for prize support for this competition. The competition appreciates their support. For clarification on Mission 3 (Preystalker) the squad point cost of the ship is doubled, not the upgrade cards. They have their total cost reduced by 10 points. The players pack has been updated with minor clarifications for issues that have been raised on the Facebook page. The Infinity Games has been listed as a sponsor of the event. As I have lent a friend some of my Imperials (That's what he shall be playing) can I change my Faction to Rebels. I have paid up and have the models to make up the 4 lists required. 14 pre-pays and an even split between Rebel and Imperial forces. Any players who plan on coming and paying on the day can you please let me know your preferred faction so we can do our best to keep the sides balanced. Another successful Lightspeed was run today. Thank you to everyone who attended. The top winner was Tom, however the Empire claims victory today with 16 wins to the Rebels 12. Congratulations to Anthony and Daniel for winning the Nerdvana SA pre-pay ships, and for Cameron and Nicholas for getting the extra random prize draw Thanks to The Hobby Matrix for prize vouchers taken by Shaun, Cameron and Evan, and to Infinity Games for the vouchers taken by Tom, Daniel and Jake. Catherine won the scum ship donated by Nerdvana Games and Chris took home the Jar Jar Binks award.